Rebecca, if you are reading right now, stop! Otherwise it will spoil a surprise! I’m taking Jennifer Mcguire’s Inspiration Showcase class right now. There’s only a few days left but you might still be able to join in a week or so as she sometimes opens classes up with a slight discount after the class is over. You won’t get a chance to win prizes nor ask questions on the forum (I don’t think) but the class is awesome! I already knew many of the techniques but she puts such interesting spins on them and uses them in ways and in combinations with other techniques I would never have thought of. I can only image how exciting this class would be for a new stamper or someone who doesn’t use techniques much! And it was a great reminder of techniques I haven’t used in ages! She has an amazing way of teaching so quickly and concisely and her videos are always clear and easy to watch. No jumpy visuals or blurred images and she always makes sure you see everything, never too fast. I am absolutely in LOVE! I made this card using the Distress Ink Embossed Resist technique. You emboss your image on white paper using clear EP and heat emboss. Then use a blending tool to add colour to the background. I needed a thank you card for my BFF who tutored my son for a super amazingly good price this summer. He was doing quite poorly in math and still didn’t know his times tables in grade 4. So she worked with him twice a week all summer, so worth every penny. She homeschooled her boys and I have to say, it’s a shame she isn’t a school teacher. She is also an excellent musician and used to teach piano. So I often use musical themes when making cards for her. 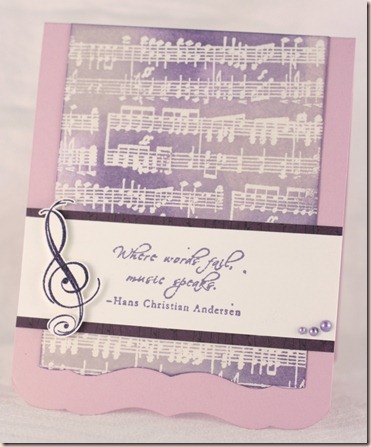 The treble clef was stamped in Distress ink and clear embossed to make it shiny like the background. The bottom edge was cut with a PTI edger die. This is so beautifully done, Rebecca!Isn't Jennifer M.'s class the best? I love the emboss resist technique and I love the distress inks that you chose for this design! Your tutoring friend would LOVE it! Thanks so much for leaving a lovely comment in MF Sketch challenge! I'm deeply honored that you liked my card! (Waving hi from Waterloo)!